The Mount Royal Cougars spent the end of their summer coaching hockey camps. Now they are gearing for the 2013-2014 campaign. The Cougars had the pleasure of coaching a wide array of young talent, from the smallest Timbits to the up-and-coming bantam sharpshooters. Head coach Jean Laforest has enlisted several Cougar players to assist him at the camp and give the players a chance to give back to the community. 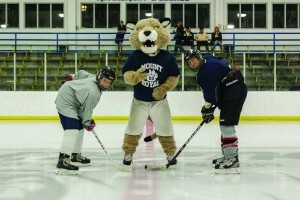 According to the MRU athletics department web page, nurturing the future of hockey is paramount to the Cougars. The camps have given the Cougars an opportunity to enjoy some downtime while gearing up for training camp — which kicks off in early September. The Cougars men’s squad are excited for their first game Friday, Oct. 4th at the Flames Community Arena. For all Cougar hockey camp information, visit the MRU Cougars Hockey Camps’ Facebook page.